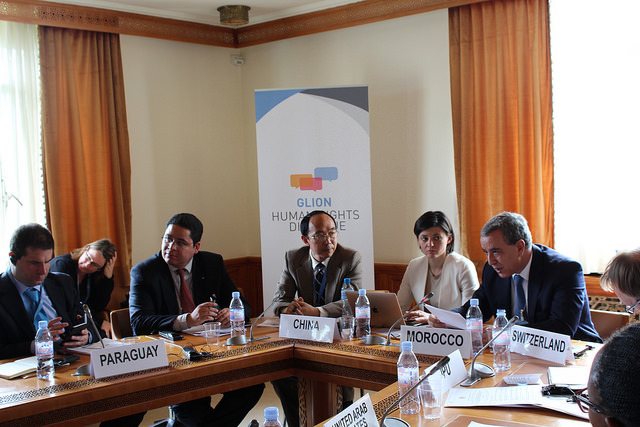 The fourth policy dialogue took place on Friday 15th April with the support of the Permanent Mission of the Kingdom of Morocco. The informal meeting provided participants with a ‘bottom-up’ opportunity to reflect on the experience of States with implementation. How do States seek to take the various recommendations generated by the international human rights mechanisms and turn them into on-the-ground change and improvement? What strategies and approaches do they use? What has worked and what hasn’t? What are the main obstacles to implementation (e.g. capacity-constraints, inadequate systems) and how can those obstacles be overcome? Key questions that were addressed by participants included: What are the different models and strategies adopted by States to coordinate implementation? ; How to strengthen the role of parliaments in implementing UN recommendations? ; How to strengthen the role of parliaments in overseeing implementation? ; How to mobilise domestic civil society to press for, and independently monitor/report on, implementation? ; How can the unique role of NHRIs by leveraged to support, monitor and report on implementation?